The Other Dream Team focuses on the role basketball has played in the Lithuanian community by helping them through bleak economic and social times, focusing specifically on the members of the first ever Olympic Lithuanian basketball team in 1992 after the collapse of communism. Marius Markevicius’s documentary begins in 1988 when the USSR were led to a gold medal over America in the Seoul Olympics thanks to the four Lithuanian men who had been recruited for the team. At those ’88 Olympics, Valdemaras Chomi?ius, Arvydas Sabonis, Šar?nas Mar?iulionis and Rimas Kurtinaitis were not only given a taste of what it was like to play basketball on a professional, international level, but those games also set a fire within them to prove to the world that they were Lithuanians, not Russians, and to win a medal for their own country. The documentary follows these men struggling for Lithuanian independence and a legitimate athletic career, but also their difficult journey under communism. The four Lithuanians were permitted to travel but only with KGB supervision, buying anything they could get their hands on in foreign countries with their extremely limited pay in order to turn around and sell it to make enough money to support their families. Arvydas Sabonis, one of the best centers in the world at the time, was even drafted by the Portland Trailblazers only to be told by the USSR that he would not be allowed to accept the contract or leave Lithuania. Finally, in 1992, Lithuania was able to attend the Olympics as its own sovereign country. Their determination and underdog status won them fans worldwide, including the Grateful Dead, who not only paid for the team’s trip to Barcelona, but also commissioned Deadhead artist, Greg Speirs, to design a logo for the team’s unforgettable red, green and yellow tie-dyed warm ups. 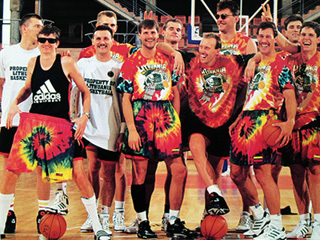 The Lithuanian ’92 Olympic team quickly became a sort of rock ’n’ roll symbol of standing up to totalitarian power, competing against not only the unstoppable American Dream Team in the semi-finals, but also facing Russia, their oppressor of a half century, on the court to compete for the bronze medal. The Other Dream Team is not just a film for sport enthusiasts or history buffs. Markevicius vividly paints an inspiring picture of a group of men overcoming great political hurdles in order to bring pride back to a country that had been broken for decades and blaze a path for future generations. The film intercuts the history of this basketball team and the USSR’s involvement with, and often brutal destruction of, Lithuania, with the present day, as a young Lithuanian basketball player is drafted into the NBA. It is impressive to see how much these men changed the sporting world and the opportunities they opened up for the youth of a country enamored with basketball. The Other Dream Team is a powerful, inspirational documentary about the rebirth of a nation’s spirit via sport.